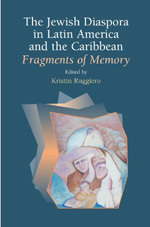 Kirstin Ruggerio is Professor of History, Director of the Center for Latin American and Caribbean Studies, and an Associate Director of the Center for International Education at the University of Wisconsin-Milwaukee. She is the author of Modernity in the Flesh: Medicine, Law and Society in Turn-of-the-Century Argentina (Stanford University Press, 2004) and And Here the World Ends: The Life of an Argentine Village (Stanford University Press, 1988). She has published numerous articles and book chapters on subjects such as Argentine women’s exclusion and maternal crimes; the devil and modernity; degeneration and fingerprinting; honor and passion; and European immigration to Argentina. Research for her work was supported by the National Endowment for the Humanities and the National Science Foundation. Since the 1970s, the Latin American Jewish Diaspora has been recognized as a unique phenomenon in diasporic studies, due to the development of new ways of thinking about internationalism and globalization. Important works of the 1980s and 1990s established the critical role of Jews in Latin America. This collection moves the field forward by providing an interdisciplinary and comparative view of Jewish experiences through history, literature, painting, anthropology, poetry, sociology, and politics.